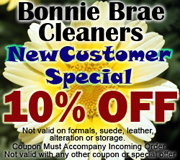 Bonnie Brae Cleaners has been providing quality garment care for Coloradoans since 1957. Whether it's your daily casual apparel or delicate designer garments, our knowledgeable, and professional staff members ensure high quality garment care. With over fifty years of experience, we are masters at hand-finishing, tailoring and emergency services. Our commitment to recruiting and retaining top personnel and providing consistent training programs ensures that our staff remains the best in our field. In addition, we believe in securing the best equipment and software available to meet the needs of our customers. We offer pick-up and delivery service to your home or office.